1. 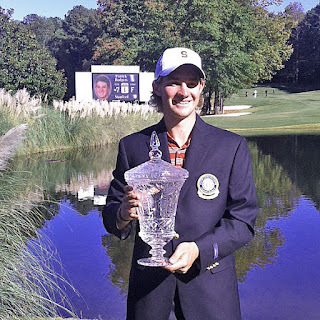 DAVID BOOTE MAKES THE GRADE --- Golf Week recently graded out the top freshman across the country and David earned top marks with his fine fall season. Here's what they had to say about David ... we hope his school marks are nearly this good. Prerequisites: The Surrey, England, native won the Welsh Boys National U-18 Championship and was captain of the 2011 Great Britain and Ireland team at the Jaques Leglise Trophy. First semester report: Boote racked up three top 10s in four tournaments this fall. He was T-7 at the Olympia Fields/Fighting Illini Invitational, T-3 at the Pac-12 Preview and T-9 at the Gifford Collegiate. His fourth start wasn’t too bad, either, as he finished T-13 at the U.S. Collegiate. His 71.3 stroke average is second on the team behind Patrick Rodgers (70.4). 2. SERVICE PROJECT - The team participates in a service project at a Boy's/Girl's Club in East Palo Alto. Here's a photo of team members with the women's water polo team and a December 5th response to each team member from the organizer after their work was done. Well done team! "We hope you all had a great experience at the GOALS/Boys & Girls Club program last night. I've already gotten some really positive feedback from the organizations about how much of an impact you spending the afternoon with the kids had! They are all talking about how they want to be student-athletes at Stanford, which is helping their coaches teach them goal-setting skills." 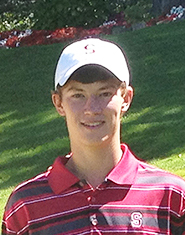 STANFORD, Calif. - The Stanford University men's golf program has signed Jim Liu, Maverick McNealy, and Viraat Badhwar to NCAA letters of intent in the 2013 incoming freshman class, announced The Knowles Family Director of Men's Golf Conrad Ray. This diverse class includes two players nationally ranked #1 in their respective countries and a home grown phenom who first won the Stanford men's club championship at age 13. Maverick McNealy is the tenth-ranked player in California according to the Junior Golf Scoreboard and will be graduating from The Harker School in San Jose, Calif. in the spring. A three-time Stanford University Golf Club Men's Champion, McNealy placed third at the 2012 NCGA Junior Amateur at Spyglass Hill. Maverick won the 2012 Stanford club championship with his last three rounds of 69-69-67. He was also a quarterfinalist at the 2012 U.S. Junior Amateur Championship and 2012 NCGA Amateur Match Play tournament at Spyglass Hill. He is the current course record holder at Sharon Heights Country Club in Menlo Park, CA after carding a 65 (-7). Viraat Badhwar will join the Cardinal from Queensland, Australia, where he is the No. 1-ranked junior golfer in Australia and a student at Kelvin Grove State College. A member of the Australian Junior Golf Squad in 2012, Badhwar has a USGA handicap of +4. He won the 2012 Toyota Junior Golf World Cup in Japan leading Australia to the World Cup title with a 12-under par 72-68-65-67 performance. Viraat was the runner-up at the 2012 Australian Boys Amateur Championship. 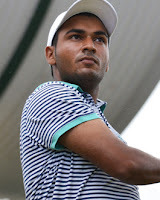 Badhwar was ranked as the #1 junior golfer in India from 2005 to 2007 before moving to Australia. Badhwar also recently was awarded the Platinum Award from Kelvin Grove State College for excellence in golf and academics. Jim Liu, from Smithtown, NY is the No. 1 ranked high school golfer by Golfweek and the Junior Golf Scoreboard. Liu will graduate from The Knox School in Nissequogue, N.Y. in the spring. Liu is a four-time consecutive AJGA Rolex All-American, and was a member of two victorious junior Ryder Cup teams in 2010 and 2012. 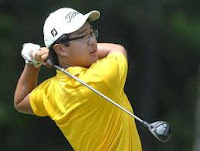 Liu advanced through the first stage of qualifying school for the 2012 European Tour, and has collected every USGA Junior Amateur Championship medal (gold, silver, stroke-play, medalist and sectional qualifying medalist). He surpassed Tiger Woods' record at the U.S. Junior Amateur, becoming the youngest champion in the tournaments' history in 2010. Liu also was the runner-up at the 2012 U.S. Junior Amateur Championship and is a four-time U.S. Kids World champion. "The 2013 Stanford Men's Golf recruiting class may go down as the strongest in our programs history," said Ray. "When we are able to sign a single No. 1-ranked player in a given year it is a big deal, but to have two is very rare. The rigorous nature of the Stanford admissions process is well known and it is a credit to these student-athletes that they have been admitted and are making a great choice in Stanford University. We are very excited to add Maverick, Jim, and Viraat to the Cardinal roster in 2013 to continue our pursuit of the programs ninth national championship." Stanford ended the tournament in 2nd, 8 strokes behind UCLA, following a steady 3rd round played under tougher conditions than the first two days. The Cardinal was led by Cameron Wilson (61-74-74 209 2nd) who finished in 2nd place individually, only 2 shots behind the winner, Rick Lamb of Tennessee. As indicated below, Cameron's remarkable 61 in round 1 was a course record and ties for the best round ever shot by a Stanford player in collegiate competition - Tiger Woods was the other player with a 61 shot in 1996. Patrick Rodgers (72-70-72 214 T9) and David Boote (72-71-71 214 T9) both tied for 9th in the event, the 3rd time in 4 tournaments this season that both have had top 10 finishes. Dominic Francks finished tied for 20th (74-69-75 218 T20), while Steven Kearney (74-77-72 223 T41) and Shane Lebow (79-71-73 223 T41) both tied for 41st. Stanford remained in 2nd place, but fell 11 shots behind UCLA, after a steady even par round led by a solid 2-under 69 by freshman Dominick Francks (74-69 T14). 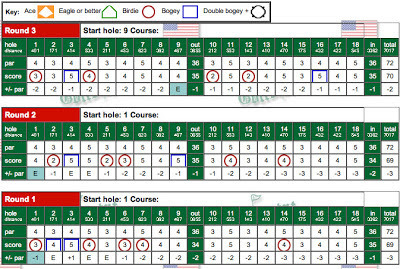 Dominick's round was unusual in that he had no bogies to go along with 2 birdies. Cameron Wilson followed up his course record 61 with a 3 over 74, but remains in first place individually at 7 under par (61-74 135 1st). It's a very common pattern to see an outstanding round followed by a mediocre one so hopefully Cameron can return to form for the final round. Stanford is in 2nd place as a team, led by an historic, 10-under 61 recorded by junior Cameron Wilson. The 61 is a new course record at CordeValle, beating PGA Tour pros Nick O'Hern and John Malinger who both shot 62 at this year's Frys.com Open. Cameron ties Tiger Woods, who also shot a 61 in 1996, for the lowest round ever shot by a Cardinal player in a collegiate tournament. 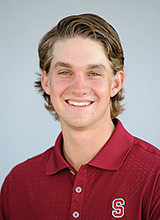 "Cameron's round today was one of the best in Stanford's golf program history," The Knowles Family Director of Men's Golf Conrad Ray told reporters. "Cameron seemed very comfortable from the first tee shot today. This is his third year competing in the Gifford Intercollegiate Golf Championship, and he likes the CordeValle course." "Cameron carried us today," said Ray. "We know what he's capable of, and he really showed that out there." 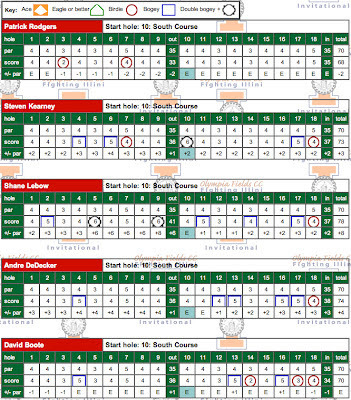 Patrick Rodgers and David Boote shot 1-over 72s with Patrick's round marred by a double on 15 and bogies on 16 and 17. 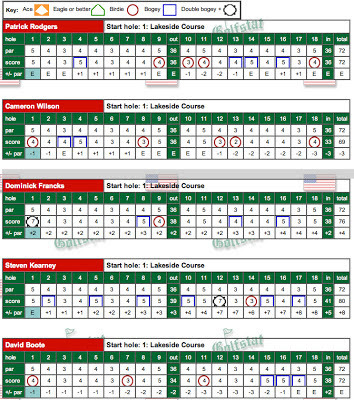 Dominick Francks and Steven Kearney each had 74 and Shane Lebow had a 79. Patrick Grimes shot 76 and Keegan English an 80 playing as individuals. The team trails UCLA by 3 strokes. STANFORD, Calif. - The # 17 (Golfstat) Stanford men's golf team wraps up its fall schedule next week as the team travels to CordeValle to compete in the Gifford Collegiate Championship hosted by UCLA. The Cardinal is part of a 10-team field that includes the # 5 Bruins, # 8 USC, # 12 Arkansas, #13 SMU, # 24 Northwestern, Oregon State, Tennessee, Coastal Carolina and Lamar. The event begins Monday, November 5 and concludes on Wednesday, November 7. This is the eighth annual event, which honors longtime sponsor and UCLA golf supporter Jack Gifford. Six-man teams will compete in the 54-hole stroke play event, with the five best individual scores in each round counting. The Robert Trent Jones, Jr. designed course will play to 7,282 yards with a par-72 layout. The Knowles Family Director of Men's Golf Conrad Ray will field a lineup of Patrick Rodgers, winner of two events this season, Cameron Wilson, Dominick Francks, Shane Lebow, Steve Kearney and David Boote. Patrick Grimes and Keegan English will participate as individuals. Keegan English, a freshman from Milwaukee and son of former Cardinal golfer Pat English '83, is making his first appearance in a tournament for the Cardinal. Stanford finished sixth at last year's event, with Rodgers tying for tenth. USC won the team competition, and Trojan Steve Lim captured the individual title. Cardinal finishes 5th in US Collegiate at the Golf Club of Georgia behind Rodgers' win! Stanford fights back from its first round and finishes 5th, only 7 strokes behind host Georgia Tech, after the final day's low round of 2-under 286. The strong final round completed a great comeback after being in 15th and last position when day one ended. The Cardinal was led once again by another spectacular tournament win by Patrick Rodgers (70-72-67 209 1st) who had a final round 5-under 67 that included 6 birdies and only one bogey. 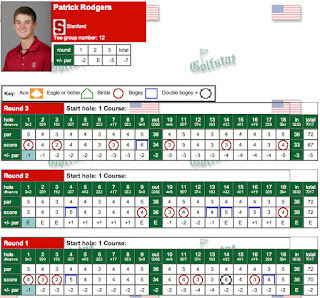 This is Patrick's 2nd win of the young season and 4th of his short career at Stanford. Patrick's 4 wins places him tied for 4th with Notah Begay on the all-time career wins list for a Stanford player, training only Tiger Woods with 11 wins, Joel Kribel with 9 wins and Rob Grube with 5 wins. 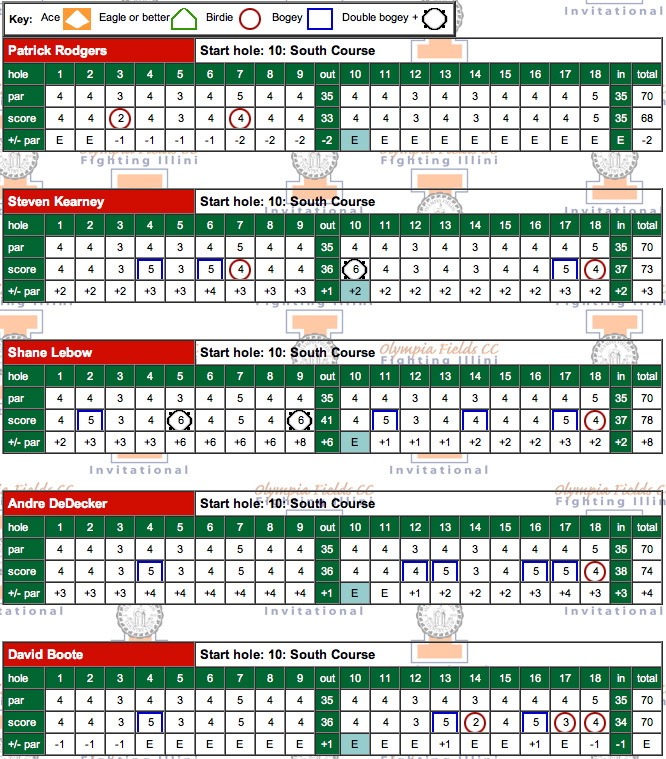 Patrick's 3 round scorecards are included below. 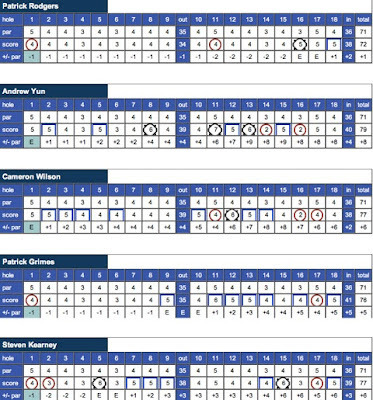 Freshmen David Boote and Dominick Francks turned in strong even par 72s on the final round while Cameron Wilson, despite an 8 on the par 5 9th hole shot 75 and Steven Kearney improved to a 77. David's steady round included only one bogey and birdie. Team results and finishes are included below (click to enlarge). "We were happy with the last couple days, but we dug ourselves a big hole on the first day," said The Knowles Family Director of Men's Golf Conrad Ray. "Our play Friday was lackluster, and we need to be better than that. I'm proud that the guys hung tough and posted two good scores. Today, our goal of the day was to be the low team of the day, and we accomplished that." Patrick Rodgers continued his elite level of play as a Cardinal golfer, taking the individual title for the fourth time in 15 collegiate events in a run of 12 top-10 finishes in just over a year. Starting the day in fourth place after rounds of 70-72, Rodgers fired a tournament-best final round 67 (209, -7) to win the event going away. Oklahoma State's Talor Gooch and Auburn's Michael Johnson tied for second, four shots behind Rodgers who made six birdies on Sunday and 15 on the weekend. "Patrick really impressed me today picking up his second win," said Ray. "He played great this week and stayed patient and hit a lot of quality shots under pressure today, which was impressive. He just continues to get better." "Today we saw a great showing by Dom Francks, shooting an even-par round after a couple higher rounds earlier," said Ray. "He got better each day, which is a sign of a guy trying hard and he's doing all the right things." The Cardinal had a solid 2nd round with a 1-over 289 total that was the 2nd best team score of the day leaving them tied for 9th, 15 strokes behind the leader UCLA. The 2nd round was a 17 stroke improvement over round one (306-289). 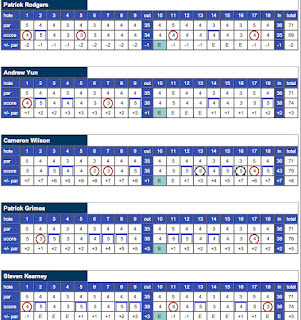 The team is within striking range of 3rd place, back by only 7 strokes, as several squads are bunched just ahead of Stanford. Cameron Wilson (79-69 148 T26) led the way in round two with a 3-under 69 that included 5 birdies and only 2 bogies. Patrick Rodgers (70-72 142 4th) had a steady 72 and is in 4th place overall and only 3 strokes behind the individual leader. David Boote (75-72 147 T21) also played well with his 72 despite three late bogies, Dominick Francks (82-76 158 T71) showed good improvement and Steven Kearney (83-80 163 T76) had to settle for an 80. It was a tough day on the links for the Cardinal as they ended in 15th place, 17 shots behind the leader Southern California. The bright spot was the strong play of Patrick Rodgers who shot a 2-under par 70 and is tied for 4th. Patrick got off to a blazing start with birdies on his first 3 holes as he went out in 34 and after birdies on 11 & 12 went to 4-under on the day. Only a double bogie on 14 marred an otherwise superb round. David Boote had a 75 and is tied for 34th while Cameron Wilson had a 79 (T63), Dominick Francks an 83 (7th) and Steven Kearney an 83 (T76). Stanford competes once again in the US Collegiate hosted by Georgia Tech against 12 of the nation's top 25 teams. The traveling squad welcomes junior Cameron Wilson to the lineup for the first time in the 2012-13 season, as he returns after extended rehab of a cranky back. The remaining squad includes All-American Patrick Rodgers, freshmen David Boote and Dominick Francks and senior Steven Kearney. The No. 13 (Golf Week) Stanford men's golf team heads back on the road this weekend to compete in the Pac-12 Preview hosted by the Oregon State. The 54-hole event will be held at Pumpkin Ridge Golf Club's Witch Hollow Course in North Plains, Ore. The field is exceptional including six teams ranked in the top 30 in the most recent Golfweek rankings: California (1), Washington (5), UCLA (6), Stanford (13) Oregon State (27) and Colorado (30). Next up was Patrick Rodgers who tied for 22nd on rounds of 73-71-71 215. In his first collegiate start, freshman Dominick Francks had a good tourney as he tied for 33rd with rounds of 76-71-73, followed by Andrew DeDecker at 77-77-73 227 T48 and Patrick Grimes with 87-74-83 244 59th. Featuring all 12 conference members, play on the 7,017-yard, par-72 course begins with 36 holes Monday and concludes with 18 Tuesday. "The team is excited to compete in the Pac-12 Preview at Pumpkin Ridge next week," said Knowles Family Director of Golf Conrad Ray. "The conference is very strong this year and we will have our work cut out for us. I think we have some good momentum coming off a solid event at Olympia Fields, and I am eager to see how we play up there. The event should be a good measuring stick on where we stand at this point in the season." Coming off a victory in his first event of the season at Olympia Fields, sophomore Patrick Rodgers is a strong contender to challenge for the individual title. Rodgers fired rounds of 72-68-67 (-3) at the Olympia Fields/Fighting Illini Invitational last week to win by five strokes. Fellow sophomore Patrick Grimes will see his first action of the season. The Atherton native competed in nine events last season, carding a stroke average of 74.8. Junior Andre DeDecker is coming off a solid performance at Olympia Fields where he tied for 39th after rounds of 73-74-78 (225, +15). Freshmen David Boote and Dominick Francks will round out the lineup for the Cardinal. Boote had an impressive showing last week in his first collegiate competition, tying for seventh at Olympia Fields (214, +4). Francks, a highly regarded recruit from Olympia, Wash., is making his first collegiate start. The first event of the 2012-13 tournament season is being played at the famed North Course at Olympia Fields Country Club outside Chicago, an event Stanford dominated in 2012 with a 16-stroke win. Olympia Fields North hosted the 2003 US Open plus three other majors and the event features a strong field. Live scoring is provided by Golfstat. This season's first event features returning 1st team All-American Patrick Rodgers and senior Steven Kearney from last year's win at Olympia Fields, plus 3 new starters, Andre De Decker, Shane Lebow and freshman David Boote. Cameron Wilson is still recovering from a back injury and Andrew Yun is not in school preparing for the PGA Tour's qualifying school. Super sophomore Patrick Rodgers repeated as individual winner with rounds of 72-68-67 207. His 3-under total was the only under par score as he won by 5 shots. Patrick's final round 67 included 4 birdies and only 1 bogey which added to his 2nd round 68 without a bogey blew away the field. Here's an excellent article by Golf Week on the tournament win by Patrick. Read excerpts from the article below. Freshman David Boote (73-70-71 214) completed an impressive first collegiate tournament as he tied for 7th individually, only 2 strokes out of 2nd position. 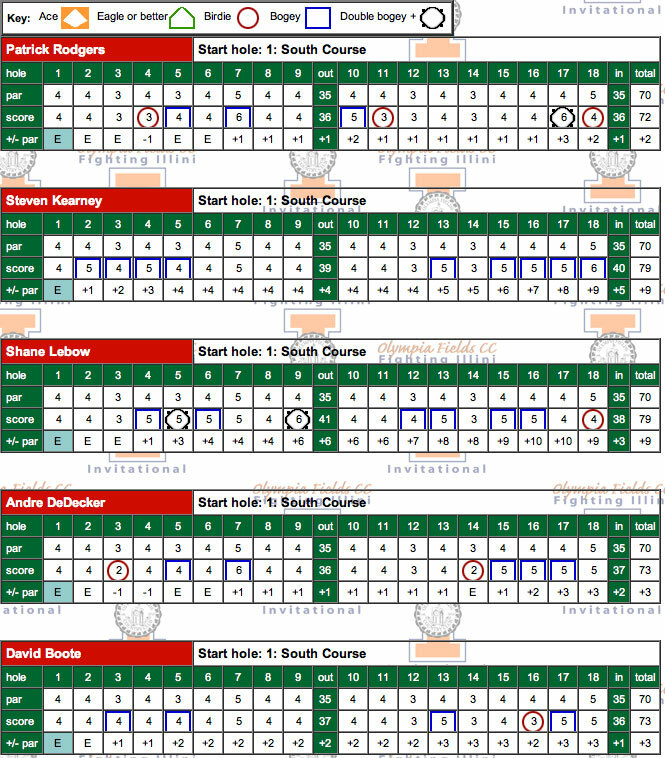 Next came Andre DeDecker (73-74-78 225 T39), followed by Steven Kearney (79-73-77 229 T56) and Shane Lebow (79-78-76 233 T65). As a team Stanford finished tied for 4th, 19 strokes behind winning Arkansas. The final round was played in cool, windy conditions that sent amber leaves blowing past players’ balls. It was a perfect day to tailgate at a Big Ten football game. This tournament was dominated by visitors from the Southeastern Conference, though. Arkansas shot 14-over 854 (283-278-293) to win by 13 shots over conference rival Florida. Cappelen, the 36-hole leader, struggled to 75 Tuesday, but Cook matched Rodgers’ 67. Illinois’Charlie Danielson also shot 3 under, matching the day’s low score. Rodgers’ comfort in his native environs is underscored by his play here the past two years. The same architect, Tom Bendelow, designed Olympia Fields’ South Course and Rodgers' home course, the Country Club of Indianapolis. Olympia Fields’ South Course, which played 7,080 yards, is slightly shorter than the North, forcing players to make decisions off the tee and defending itself with trickier greens. Rodgers made just one bogey over the final 36 holes. He hit sand wedge to 15 feet on the second hole for Tuesday’s first birdie. He sank an 8-footer for birdie on No. 6 that he had to play “pretty much sideways,” then wedged close to birdie the par-5 seventh hole. He made bogey on the ninth hole before rolling off eight consecutive pars. His round ended with a 15-foot birdie putt on the par-5 18th. The victory was his third in 13 career collegiate starts. He was a first-team All-American last year after representing the United States at the 2011 Walker Cup. Rodgers returned home from the Walker Cup just two days before the start of last year’s Olympia Fields Intercollegiate, driving from Indianapolis to meet the team for his Cardinal debut in this Chicago suburb. He hadn’t set foot on Stanford’s campus as a student before that victory. This season starts with high expectations after his freshman success. He considered attending Q-School because of the PGA Tour’s drastic changes to its qualifying structure, but decided to stay in school. He played three professional events this summer, missing the cut at the PGA Tour’s Travelers Championship (72-73) and John Deere Classic (67-74), as well as the Web.com Tour’s Nationwide Children’s Hospital Invitational (76-73). Things started to turn around later in the summer. He was third in his title defense at the Porter Cup and advanced to the second round of the U.S. Amateur. He said he struggled at the start of the summer as he tried to make swing changes at Stanford. This was the first time he didn’t have regular access to his coach, Kurt Schier, who lives in Indianapolis. “I’m getting back to some older positions,” Rodgers said. “I kind of got away from a few things that had me hitting it well.” Those struggles had their benefits, though. They helped him improve his short game and game management. He has implemented a new tee shot – a low cut with the driver – that will help him hit fairways on tighter holes. His sophomore season is off to the right start. Stanford advanced to a tie for 7th place after shooting the 3rd best round of the day, a 585 total, but is now 21 strokes behind as it lost ground to leading Arkansas. The Cardinal is 9 behind the 2nd place team from Auburn. 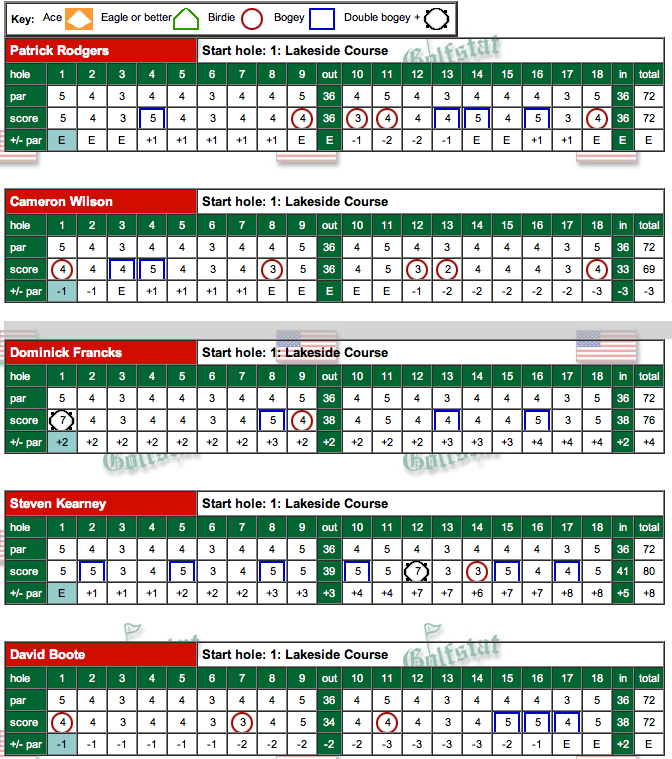 Patrick Rodgers (72-68 T3) led the way once again, followed closely by freshman David Boote (73-70 T9). 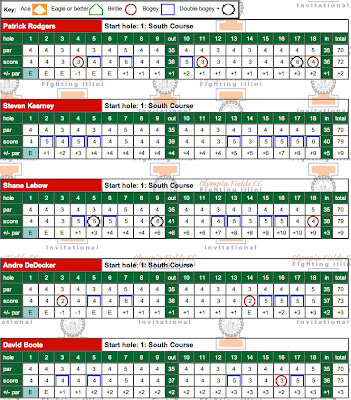 Next is Andre DeDecker (73-74 T29), then Steven Kearney (79-73 T54) followed by Shane Lebow (79-78 T68). Stanford is tied for 9th, 14 shots behind after rounds of 72 (Patrick Rodgers), 73 (Andre De Decker and David Boote) and 79 (Steven Kearney and Shane Lebow). The highest-ranked team in the field, No. 8 Arkansas, lived up to its ranking, shooting a first round 283 (+3). 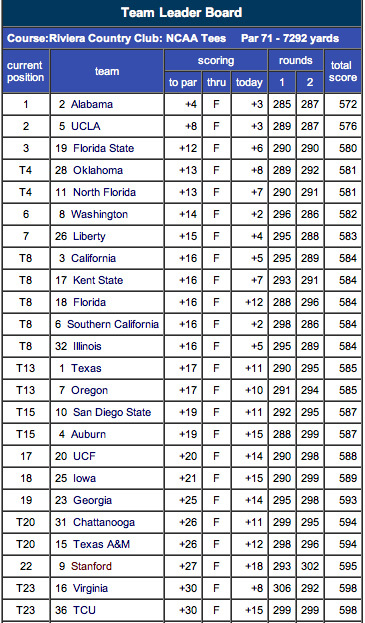 That's five strokes in front of Northwestern (288) and six better than third-place Auburn (289). Northwestern's Nicholas Losole was the only player to break par, firing a two-under par 68 to lead the field individually by two strokes over six players. PACIFIC PALISADES, Calif. -- - Stanford's men's golf season came to an end today at the NCAA Championships after the Cardinal tied for 19th place with Central Florida, failing to crack the top eight to advance to the match play portion of event. The Cardinal posted its best team score of the tournament today, shooting a six-over 290 at Riviera Country Club. However, Stanford finished at 885 (+33) for the 54-hole stroke play competition, which was 26 strokes behind first place Alabama (859; +7) and 10 strokes out of the eighth spot. The Crimson Tide, along with UCLA, Texas, San Diego State, California, Washington, Oregon and either Kent State or Florida State advance to match play to decide the NCAA champion. The Golden Flashes and Seminoles tied for eighth at 875 (+23) and will play-off for the eighth and final spot in the match play field tomorrow morning. Freshman Patrick Rodgers capped off a sensational season with a ninth place showing in his first NCAA Championship event. Rodgers shot a 73 today and finished at 214 (+1) for the tournament, marking his 10th top-10 finish in 12 events this season. Rodgers finished six strokes behind medalist Thomas Pieters of Illinois, who closed with a even-par round of 71 on Thursday to earn a three stroke victory over Julien Brun of TCU and Tyler McCumber of Florida, who both finished at 211 (-2). Rodgers was even par through 14 holes on his round today but bogeys on 15 and 18 left him at two-over for the day. 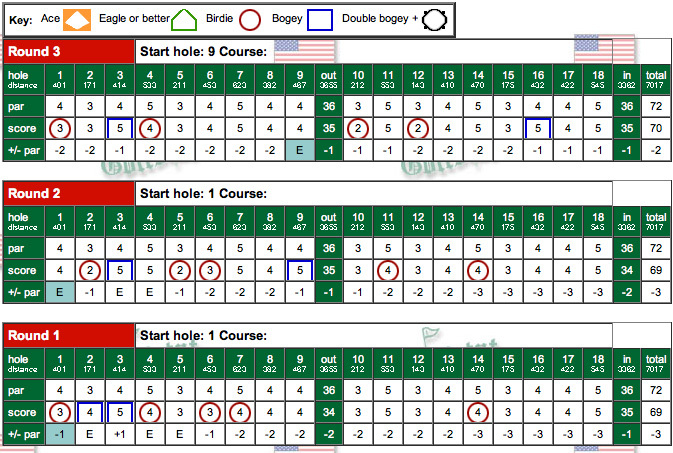 Stanford's low round of the day was turned in by junior Andrew Yun, who shot a one-under round of 70. Starting on No. 10, Yun was five-under on his round through 11 holes after birdies on 10, 12, 16, 17 and 1. He then made three straight bogeys to move back to minus-two on the day. Yun birdied the par-4 fifth hole, his 14th of the day, but bogeyed his 16 and 18 for a 70 and a 54-hole score of 223 (+10) to tie for 69th place. Steven Kearney tied for 77th place at 224 (+11) after closing with a 73. The junior was two-under through 11 holes but made four straight bogeys on his second nine en route to a 73. Patrick Grimes shot a 77 today to tie for 120th at 229 (+16) while Cameron Wilson tied for 123rd at 230 after a final round 74. 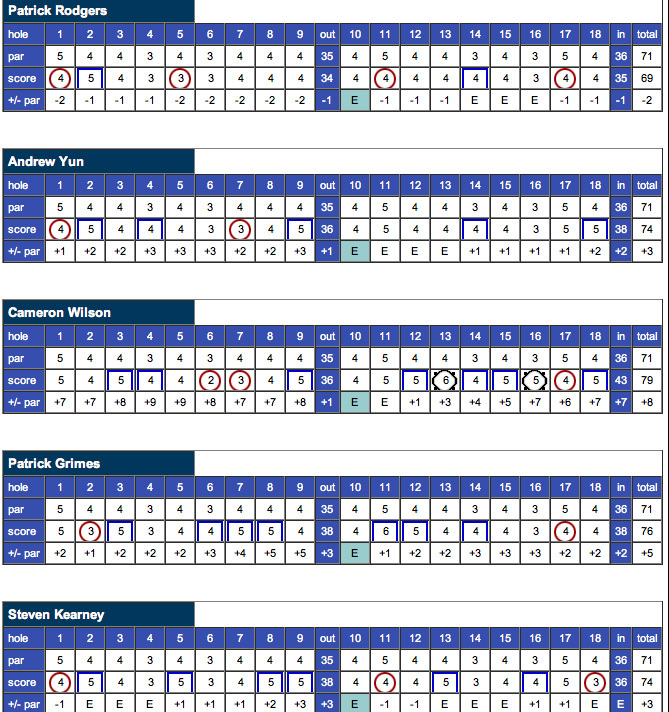 Final round scorecards can be found below. Cardinal Chips: Patrick Rodgers, David Chung and Cameron Wilson will attempt to earn a spot in the U.S. Open at the Olympic Club on Monday through sectional qualifying...Rodgers and Chung will take part in the 36-hole sectional qualifier at TPC Harding Park and Lake Merced Country Club, while Wilson will travel east to the Canoe Brook Country Club in Summit, New Jersey to try to earn a trip to Olympic...Rodgers will tee off at 7:36 a.m. at Lake Merced and at 1:06 at Harding Park...Chung will play his first 18 holes at TPC Harding Park beginning at 7:45 a.m. followed by a 1:15 starting time at Lake Merced...Stanford alums Joel Kribel (8:03 Harding/1:33 Lake Merced) and Dodge Kemmer (8:12 Lake Merced/1:42 Harding Park) are also in the Daly City qualifier, while Casey Martin will go through sectional qualifying at the Emerald Valley Golf Course in Creswell, Ore.
Stanford has its work cut out for itself tomorrow during the final round of the NCAA Championships being held at the Riviera Country Club in Pacific Palisades. The Cardinal currently sits in 22nd place at 595 (+27) after shooting a second round 302 (+18) on Wednesday, 11 strokes out of the coveted eighth position. The top eight teams advance to the match play portion of the event used to determine the NCAA champion. 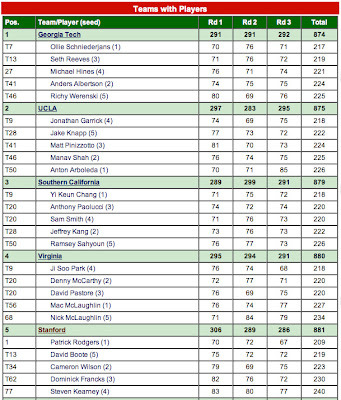 At 572 (+4), Alabama continues to lead the stroke play portion of the tournament, four strokes clear of UCLA at 576 (+8). 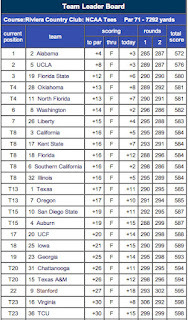 Florida is in third place at 580 (+12) followed by Oklahoma and North Florida at 581. Washington and Liberty are tied for sixth at 582 (+14). Five teams are tied for eighth place at +16, while nine teams are within 10 strokes of the final spot. Riviera took a bite out of the Cardinal today, as no player managed to shoot par on the 7,292-yard layout known as Hogan's Alley. Patrick Rodgers made a bogey on the challenging par-4 18th hole to finish with a one-over 72. At 141 for 36-holes, Rodgers is just four strokes off the lead held by Illinois' Thomas Pieters, who fired a three-under 68 to move to the top of the leader board. 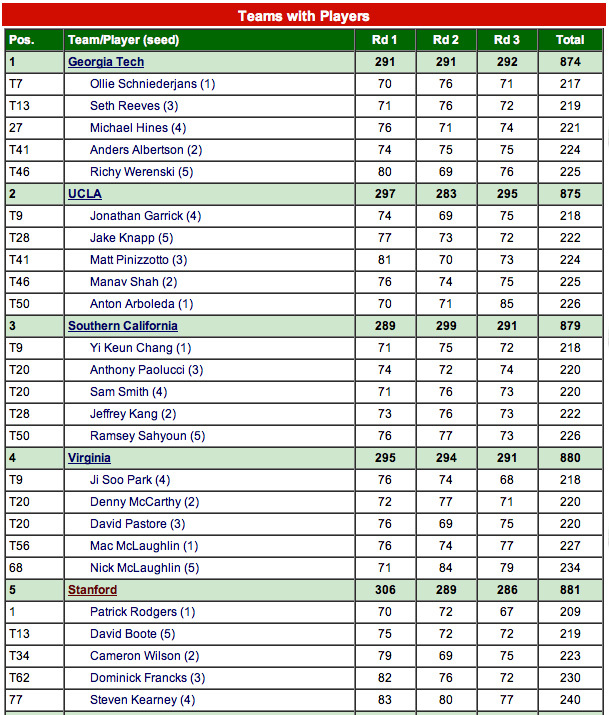 A 137 (-5), Pieters enjoys a two stroke lead over Anton Arboleda of UCLA and Tyler McCumber of Florida. Rodgers opened his second round with a birdie and then after nine straight pars, picked up his second birdie oorf the day on No. 11 to move to two-under on his round. However, a double bogey on the par-3 16th hole and a bogey on the last left him at 72 for his round. Stanford's next best round of the day was turned in by freshman Patrick Grimes, who shot a 76. He was even at the turn but six bogeys and just one birdie on the backside resulted in a five-over 76. Grimes is currently tied for 104th place at 152 (+10) with one round remaining. Steve Kearney, who is tied for 92nd at 151, got off to a fast start with birdies on his first two holes but gave the strokes back with a double bogey on the fifth. He made bogeys on each of his last three holes on the front side enroute to a 77. Andrew Yun, who has hurt by three double bogeys, shot a second round 79 and is tied for 117th place at 153 (+11). Cameron Wilson is tied for 138th after a second round 77 left him at 156 (+14) for 36 holes. Stanford ended the first day 3 strokes off the cut line with two rounds of medal play remaining to determine the 8 teams advancing to match play. As expected, the famed Riviera course played tough with no teams breaking par as Alabama finished 1 over in first. 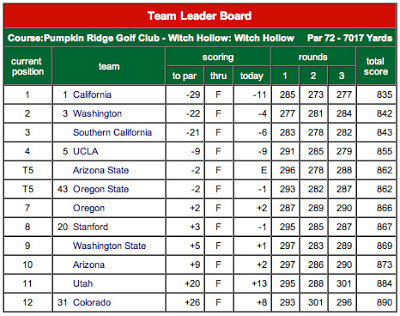 Stanford tied for 13th but is only 8 strokes out of the lead in a tightly bunched field. 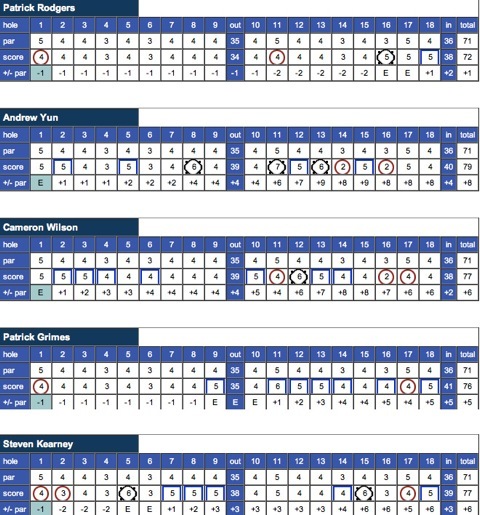 The Cardinal was led by Patrick Rodgers' 2-under 69 (T4), two strokes off the individual lead, followed by Andrew Yun and Steven Kearney with 74s (T62), Patrick Grimes at 76 (T98) and Cameron Wilson at 79 (T137). STANFORD, Calif. -- - Stanford will continue its quest for its ninth NCAA Men's Golf Championship beginning on Tuesday at the venerable Riviera Country Club in Pacific Palisades, Calif. The 30-team field will play 54-holes of stroke play over three days, with the top eight teams advancing to the single-elimination, match play format that will be used to determine the national championship. The Cardinal, which earned a spot in the field by virtue of its fourth place finish at the Stanford Regional, will be joined by Alabama, Alabama-Birmingham, Auburn, California, Central Florida, East Carolina, Georgia, Iowa, Lamar, Liberty, Florida, Florida State, Illinois, Kent State, Memphis, North Florida, Oklahoma, Oregon, San Diego State, Tennessee-Chattanooga, Texas, Texas A&M, TCU, Tulsa, UCLA, USC, Virginia, Virginia Tech and Washington. Alabama (Athens), Liberty (Greensboro), Washington (Norman), UT-Chattanooga (Bowling Green), USC (Ann Arbor) and California (Stanford) each finished first in their respective regionals to earn a trip to Pacific Palisades. Stanford, seeded ninth in the field, will be paired with Oregon and Washington for the first 36 holes of the event. The Cardinal, Ducks and Huskies will tee off at 1:10 p.m. on Tuesday and 7:50 a.m. on Wednesday. Teams will be repaired according to the standings for the final 18 holes on Thursday. Seedings for the match play portion of the event will be determined by order of finish in the stroke play competition. Stanford has won eight NCAA team crowns, most recently in 2007, when the Cardinal posted an 11-stroke victory over Georgia at the Golden Horseshoe Golf Club in Williamsburg, Va. The Cardinal narrowly missed out on repeating as national championships the following year, finishing one stroke behind UCLA in West Lafayette, Ind. The Cardinal failed to qualify for the match play portion of the 2009 NCAA Championships held at the Inverness Country Club in Toledo, Ohio and were defeated by Oklahoma State, 4-1 in the first round of match play in 2010 at the Honors Course in Chattanooga, Tenn.
Stanford did not qualify for the NCAA Championships last season after finishing sixth at the Central Regional. Stanford's seven other NCAA crowns came in 1938, '39, '41, '42, '46, '53 and '94. Knowles Family Director of Golf Conrad Ray is expected to enter a lineup consisting of (in order) Patrick Rodgers, Andrew Yun, Cameron Wilson, Patrick Grimes and Steven Kearney. 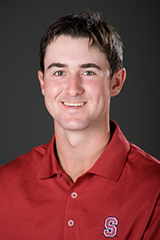 Rodgers who was one of three finalists for the Hogan Award won by Patrick Cantlay of UCLA, has nine top 10 finishes in his 11 events this season, including a pair of wins. His current stroke average of 70.6 is tied with Tiger Woods (1995-96) for second on Stanford's all-time single-season list, slightly behind Joel Kribel's school-record mark of 70.1 set in 1998-99. The Pac-12's Freshman of the Year has shot par or better in 25 of his 34 competitive rounds this season. Yun is coming off a tie for 15th at the Stanford Regional, where he shot rounds of 72-69-68 to finish at three-under 207. A two-time first team all-conference selection, Yun has six top-10's this season, including a win at the Pac-12 Championships. Wilson has been steady at the No. 3 position and is coming off a 22nd place showing at the Stanford Regional after rounds of 70-70-69 on the Cardinal's home course. Grimes, a freshman from Palo Alto, has been a fixture in the lineup for the last three tournaments while Kearney returns to the lineup for the first time since the Stanford Intercollegiate in late March. "We made a little bit of a lineup change in the fifth spot, with Kearney joining us," said Ray. "It's tough not having David (Chung) there, but his game is in a bit of a funk right now and I felt we needed to shuffle the deck a little bit." Ray feels the unique format of the NCAA Championships, where the eight low teams from the 54-hole stroke play competition advance to match play, can open the door for a lot of teams to claim the crown. "The match play format certainly brings a lot of teams into the picture. You have to get there first, obviously. But match play will take a team with five guys who can really go low and turn them into just one point. It's a unique way to crown a champion and Riviera is a great match play course." Ray says resiliency, a hot putter and a short-term memory are the keys to success in match play. "All of our guys have played a lot of match play on different levels throughout their careers. At the end of the day, you still have to hit quality shots." Riviera Country Club, with its tricky, bent grass greens and kikuya fairways, will present a formidable test for the field. "It's a championship course, not doubt about it," said Ray. "Our guys are very excited about playing a course that has produced so many great champions over the years." Opened in 1927, the Riviera Country Club's George Thomas-designed golf course has, since its inception, served as the venue for championship golf in Southern California. From MacDonald Smith's second title in 1929 to Ernie Els' first title 70 years later, the PGA Tour's Los Angeles Open has been a regular event at the club. The classic Riviera layout has also produced many other champions, such as Byron Nelson, Sam Snead, Tom Watson, Johnny Miller, Nick Faldo, Fred Couples, Craig Stadler, Hale Irwin and, of course, Ben Hogan. 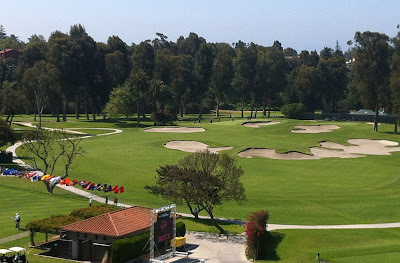 Indeed, Riviera has long been known within golfing circles as "Hogan's Alley", a nickname bestowed upon it by three-time Masters champion Jimmy Demaret after Hogan won the 1947 and 1948 Los Angeles Opens and the 1948 U.S. Open at the Club within a span of 18 months. That U.S. Open, the first event to be played West of the Mississippi, would be followed in turn by the 1983 PGA Championship (won by Hal Sutton by one shot over Jack Nicklaus), the 1995 PGA Championship (won by Steve Elkington over Colin Montgomerie in a playoff), and the 1998 U.S. Senior Open (won by Hale Irwin), providing Riviera with a championship legacy matched by few others. Notable holes include number ten, a driveable par four that yields birdies and double bogeys with equal swiftness, and a massive par four at number fifteen that plays directly into the ocean breezes. The monumental par five 17th hole measures 578 yards, all uphill. The finishing hole is a world-famous 454-yard par four that plays to an elevated fairway, then requires a long second shot to a narrow green. The green is surrounded by a natural amphitheater, providing a commanding view of the Clubhouse. Today, Riviera remains one of golf's few genuine classics, with a course layout that is virtually unaltered, yet every bit as great and testing as the day it was opened. Listed prominently in every recognized domestic and international course rating, its combination of layout, history and proven excellence as a major tournament venue makes Riviera one of the world's great tournament sites. (Courtesy of Riviera Country Club).